The photo id for this photograph is 77, in the Schools album. 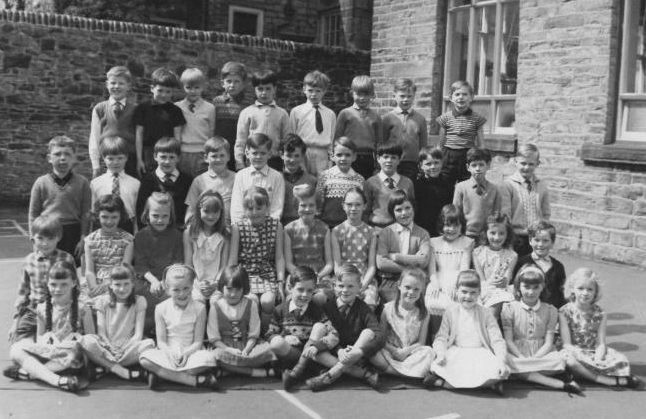 Bottom row end right - me - Judith Searson! From left bottom row - Sally Ann Shatwell, Margaret Hughes, Kathy Kennedy, Sharon Hulme, Kenneth Higginbottom, David Hartley, Debra Woolley, Elaine Ashby, Helen Ritchie, me. Next row - David Cooper, Tina Thorp, Ann Hill, Elizabeth Knowles, Pamela Bate, Margaret Cadwallader, Vivien West, Christine Tolley, Jean Stenson, Margaret Harding, John Fletcher. Next row - Haydn Jones, Peter Lomas (Bomber! ), Tim Hoggard, Chris Simpson, Philip Day Ian(? )Wain, Roger Hodgson, Robin Cridland, Andrew Longson, Martin Isherwood, Simon Philips. I love this photograph. It brings back great memories. I have spoken to Judith Searson and Martin Isherwood on friends reunited.